The notoriously busy A1120 bypasses Framlingham, but hurtles through the neighbouring straggle of Saxtead on its impatient journey to the coast. Saxtead's most famous building is its post-mill, familiar to owners of Pevsner's Suffolk from the back cover; it sits on Saxtead Green about half a mile from All Saints. The church is a far less prominent building than the mill. It lost its tower on the 8th July 1805, one of several in the county that collapsed before the Victorians had a chance to restore them. One wonders what the Suffolk landscape would be like today if the Oxford Movement had never happened. The surviving little structure with its odd western face is constrained within and hidden by a tight churchyard full of mature trees, which look very beautiful, but make photographing the exterior in summer difficult. You could easily drive past without noticing it. The porch is a typical 15th century Suffolk job, all flushwork and niches. The church it stands against is much older, and we still see it largely in its 13th and 14th century form. All inside is neat and clean, a typical small Suffolk parish church. Apart from the 17th century holy table and communion rails, the furnishings are all 19th century and later. But the benches retain some medieval ends; these are very vandalised, but retain traces of some figures. Mortlock thought that they were done by the same carver as those at neighbouring Tannington - indeed, they may even have come from the same church. A curious square window beside the lower door to the rood loft stair was probably created when the stairway was removed. There is a fine decalogue board and royal arms. One of the most interesting features of the church is the set of stocks and whipping post in the porch. Similar survivals can be seen in the porches at Redlingfield and South Elmham St Margaret and also at Ufford where they are by the gate. I think this set is the best of all, though. They bear a warning to 'Fear God and Honour the King' - none of this wishy-washy liberal nonsense in the 18th century Church of England. 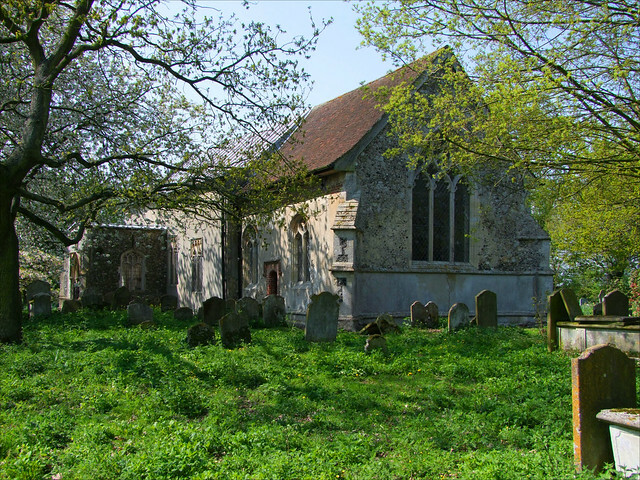 But really, to step outside again is to save the best until last, because Saxtead's beautifully overgrown graveyard is an utter delight to explore, especially on a sunny day in late spring or early summer. Here, as Thomas Gray famously observed in the middle years of the 18th Century, Beneath those rugged elms, that yew-tree's shade, Where heaves the turf in many a mould'ring heap, Each in his narrow cell for ever laid, The rude forefathers of the hamlet sleep. Here are the blacksmith and the ploughman in their serried crooked ranks, the old couples married for sixty years and then dying within a few weeks of each other, and their children, taken from them in infancy, or childhood, or early adulthood. The Pipes and the Mannings, the Wightmans and the Buttons, the Davys and the Bardwells, the surnames repeated down the long Saxtead generations. And some of the children do not lie here at all of course, the inscriptions merely remembering their disappearance into the mud and blood of Flanders and the Somme a century ago, just a name now in the parish that gave them birth; but who, all across England, are increasingly still remembered.